The 88th Annual Academy Awards ceremony will happen on Sunday, February 28th. As in years past, we've taken a look at this year's short film competitions. 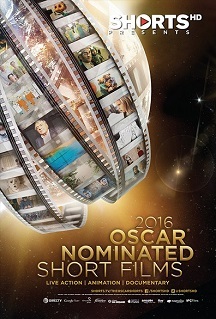 The Academy defines a short film as an original motion picture running 40 minutes or less, and excludes all advertisments, unaired or unsold television episodes, or credit sequences from feature-length films. Our critic, Shawn Hazelett, watched and ranked all of this year's Oscar-nominated shorts. Today, he looks at this year's animated category. One day while playing, a little girl is visiting by a future clone who has travelled back through time to relay her memories before her future world ends. Just as the little girl can’t begin to comprehend the complexity of quantum physics relayed by her clone, the clone can’t begin to understand the humanity and simple pleasures enjoyed by the human. It’s rare for an animated short to be a talky, but World of Tomorrow is anything but common, pairing a high concept with elementary school-like animation and indulging in existentialism while providing a lot of laughs. A story about a Indian father instilling a sense of cultural heritage into a son more interested in super heroes won’t offer much in complexity, but this sweet, heartfelt entry from Pixar is a lesson in concept and economy, recalling work that made them animation titans. Occasionally, studios like Disney will employ the mostly bygone tradition of placing an animated short before a film with similar themes. Watching Prologue feels like a missed the opportunity to have a pairing with The Revenant, as the former pits two Spartans against two Athenian warriors. The meticulous animation becomes even more detailed as arrows slice through throats and knives are driven into bellies. Two best friends living their dream of becoming astronauts have everything scuttled after an unexpected malfunction. We Can’t Live Without Cosmos hits its stride during early periods of levity, but feels less imaginative in its unexpected foray into realism. A melancholy story about a circus bear hoping to return to his family has the ingredients of a story that should pack an emotional punch, but somehow Bear Story doesn’t quite hit. Very Interesting. I want to watch the Bear story. Sounds good! Bear Story is my favorite.